HTC debuts a new LTE-enabled Android smartphone dubbed the 'Raider 4G' in South Korea. 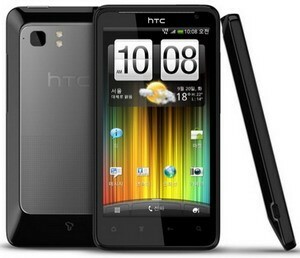 HTC Raider 4G is powered by Android 2.3.4 Gingerbread OS with HTC Sense 3.0 and boasts a dual-core 1.5GHz processor. It has a 4.5-inch qHD (540×960 pixels) touchscreen display, 1GB RAM, 8MP rear camera with dual LED flash, 1.3MP front-facing camera, 1080p HD video recording. Other features include Wi-Fi, 16GB built-in storage, DLNA support through HDTV, a 1620mAh battery, and of course MicroSD card support. HTC Raider 4G LTE Android smartphone should be available in the near future via South Korea's leading mobile telephone service provider, SK Telecom. From previous leaked report we've learned that it will be called HTC Holiday when it's available on AT&T in the US. 0 comments on "HTC Raider 4G LTE Android smartphone with 4.5-inch qHD screen debuts in South Korea"